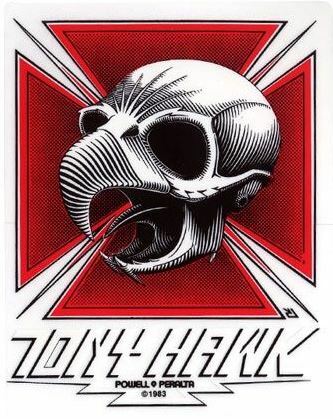 This graphic for Tony Hawk. Its cool. The hawk skull tied in with Powell and the ripper skull. Tony Hawk is the most famous skateboarder. He invented some many tricks and adapted so many more to vert. After being the most famous skater for decades. He landed the 900 at a perfect time to launch him into main stream stardom. The Tony hawk Pro Skate video games were the best attempt to make a skateboarding game. Others have since made better game play but not the success. I don't even know what to say about Tony. He has done so much both on and off the skateboard. I will be sure to add more to this article. It will take some time and thought. He is just that great!